Scott got home late Thursday night from a flight that tipped him over the “100k miles flown in a year” mark. He has also spent more than 60 days away for business travel this year. So last night, to celebrate his return home from what should be his last trip of the year, I cooked a steak, a baked potato, and a salad per his request. I went to Ottomanelli & Sons on Bleeker Street in the West Village to get a dry aged porterhouse and a genial hard time by the old school butchers behind the counter. I love old school butcher shops; butchers usually seem to like their jobs, enjoy giving advice, and take pride in the meat that they sell, and with good reason in this case. The steak was exceptional. I don’t generally do a lot for breakfast; I’m not usually great at measuring ingredients first thing in the morning, but since I was on a roll with the “Welcome home Scott/ holiday baking spirit” I made an exception today and baked. Combining three of Scott’s favorites- scones, bacon, and the healthfully virtuous feeling one gets from eating oatmeal- I combined bits of lots of scone recipes and the memory of eating “pannenkoeken met spek” (pancake with bacon) years ago in the Netherlands (and persuaded a Waffle House cook to semi-replicate by putting an order of bacon into the waffle iron with my waffle batter) into a slightly sweet, hearty, flaky, just a little salty/bacony scone. 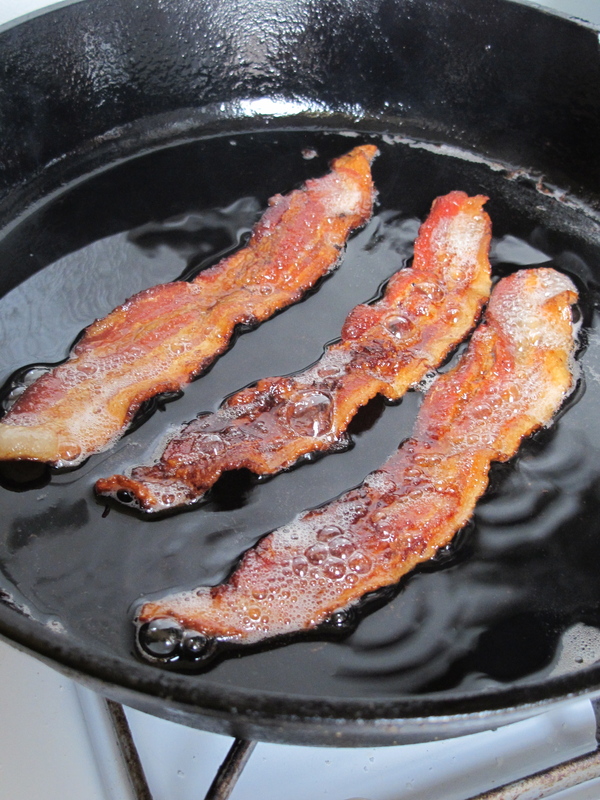 Cook your bacon until very crisp, to the point that it shatters into little bits when chopped with a knife. Drain on paper and allow it to completely cool before chopping it. In a large bowl, mix all of the dry ingredients from flour to bacon and stir to get them thoroughly combined. 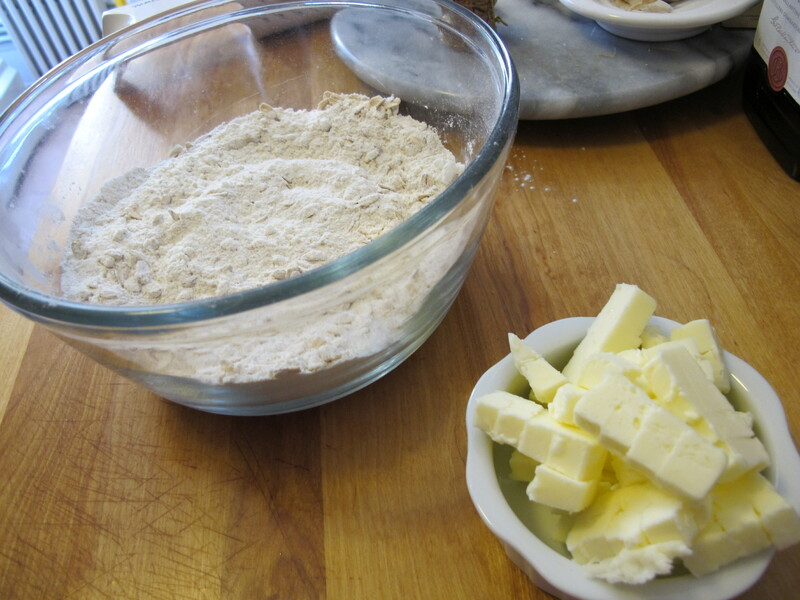 Add the cold butter cubes and using either a pastry blender or your fingers, work the butter into the dry ingredients until everything looks like breadcrumbs; the butter should still be a little chunky, but nothing larger than a pea. Whisk the buttermilk and beaten egg together and pour about ¾ of the mixture into the dry ingredients. Stir everything together, gently, just to get everything moist; try not to over-stir. If the mixture isn’t coming together into a soft dough, add the rest of the liquid in tablespoons so the dough doesn’t get too sticky. Turn the dough out onto a work surface. I like to use a flexible plastic cutting board for pastry because I don’t have to use extra flour to dust the surface, it allows me to move the dough onto the baking sheet easily, and it’s easy to clean up. Gently knead the dough a few times into a ball, then flatten it into a disc. Using a long bladed knife or a bench scraper, cut the dough into wedges (I did 8). Transfer the disc onto the baking sheet. It should still look like a disc with the wedges cut into it. Sprinkle the top generously with raw sugar crystals for a little sweet crunch on the top. Sounds like a great combo of salty/sweet, soft/crispy, and artery-opening/artery-clogging. They look fantastic! That’s exactly the magical combination I was aiming for. So happy to see your blog!! This looks beautiful…I love scones, will have to give them a try…perfect for a Christmas breakfast! I’m buying bacon today just so I can make these! I say go for it! Just chop it up small so you don’t have chewy pieces, which is why I was so adamant about making the bacon really crisp. 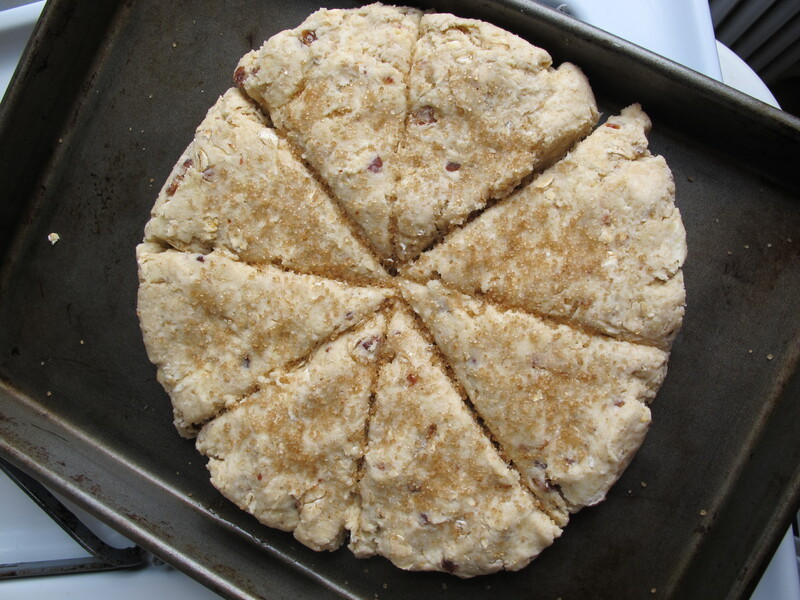 The scone recipe I use is photocopied from Ladies Home Journal, circa 1991, I think, and it lists about 10 variations, including bacon-black pepper and oatmeal, but not bacon-oatmeal. (Chive-cheddar is usually my favorite, but I do like the bacon scones.) Or rather it’s adapted from that recipe… the photocopy plus all the pencil notes scrawled in the margin. Are all of those savory? Which begs the question, what’s the difference between a scone and a biscuit? No, there’s some sweet ones in there, but I don’t usually make them. 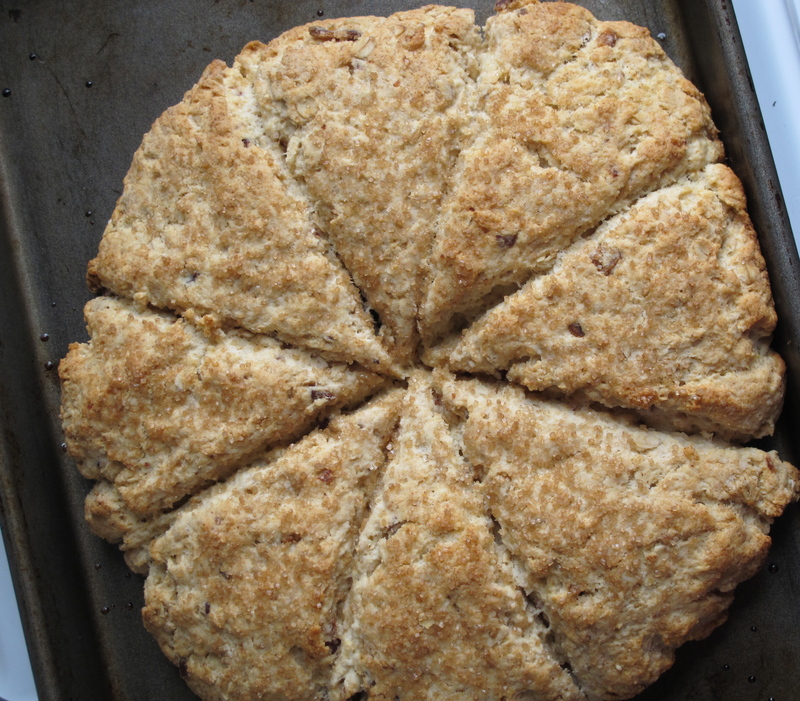 The difference between a scone and a biscuit… one is Scottish. And triangular. Scones make you sound trendier if you’re American. 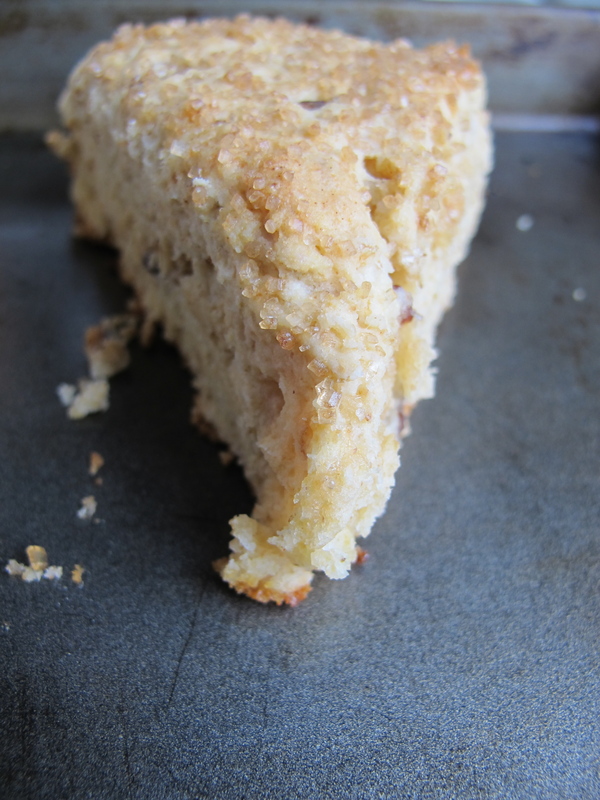 Scones often have an egg in them, (Southern-American) biscuits never do. And FWIW I prefer flaky biscuits with larger pieces of butter left in the dough, whereas with scones the butter is always (in my experience) worked in pretty thoroughly so that they’re more crumbly. I don’t think there’s a bright line. David, I’d like to see this recipe. Is that possible? This is not as rich as the above… Really basic but open to variations. Whisk 2 cups all-purpose flour, 2 tablespoons sugar, 1 teaspoon baking powder (the recipe originally said 2), 1/2 teaspoon baking soda, and 1/2 teaspoon salt. Cut in 1/4 cup butter. Beat an egg and beat in 2/3 cup buttermilk, and stir this into the flour-butter mixture. Knead lightly, pat into an 8-inch circle, cut into wedges, As Above. Bake 9 minutes at 425 F, then turn the oven off and let bake another 6 minutes or so. If you want cheddar-chive, reduce the sugar to 1 tablespoon and stir in 1/2 cup good cheddar cheese and a tablespoon or more of chopped fresh chives. Of course, you could do that with any scone recipe. Christine, I made these on Christmas morning and they were absolutely delicious!!! They were so simple to make!! Everyone at my house loved them. Thanks for the yummy recipe!! Keep them coming. I hope that you and Scott had a wonderful Christmas. Thank you, Molly! I’m really glad you enjoyed the recipe! It’s better if you use buttermilk because if you use regular milk you need to adjust the leavening to compensate for the difference in acid content in the milk- BUT, you can make a very simple buttermilk substitute by adding a tablespoon of vinegar or lemon juice to a cup of milk and then letting it sit for 10-15 minutes.